Digg is a popular social news site that launched a new feed reader application alternate to Google Reader before one month. It is already available for web and iOS, now they released their official Android app too. 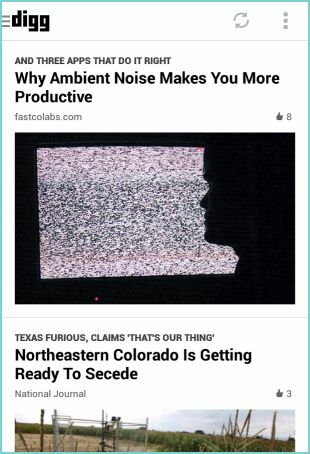 Digg for Android offers all stories from the Digg homepage as well as Digg Reader support to read your favorite web stories. This is the first release for Android that comes with a few missing features such as “Show only unread Items”, text size, display mode options and background updating. Digg is now working to improve these missing features and you will get new updates soon. 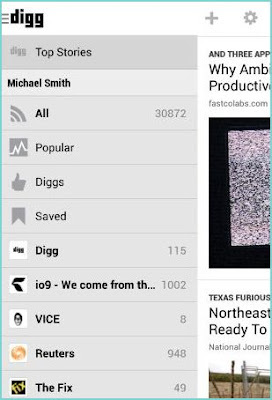 Digg app is now available on Google Play Store for free. • Quickly swipe back and forth through Digg’s Top Stories, as well as through any feed or folder in Digg Reader. Choose from either the web view or the parsed text view. • Digg or save any story; send it to Instapaper, Pocket or Readability (automatically upon save, if you choose); and share to Facebook, Twitter, Google+, LinkedIn, Tumblr, WordPress, Buffer, Dropbox, Google Drive, email, text or any other sharable app on your device. • Search Digg Top Stories. • Sort your Digg Reader items by popularity to quickly see which of your items are the most talked-about on the social web. • Log in to Digg Reader with your Google, Facebook or Twitter account. • Search for and add new feeds. Create, organize and delete folders. • If you so choose, post your diggs automatically to your Facebook timeline.